Earlier this year, I wrote about a wonderful library project that Tibetan friends in India are putting together for a Tibetan exile community there, with the support of His Holiness the Dalai Lama. Here's an update from my friend Phuntsok Dorjee, who is one of the organizers. 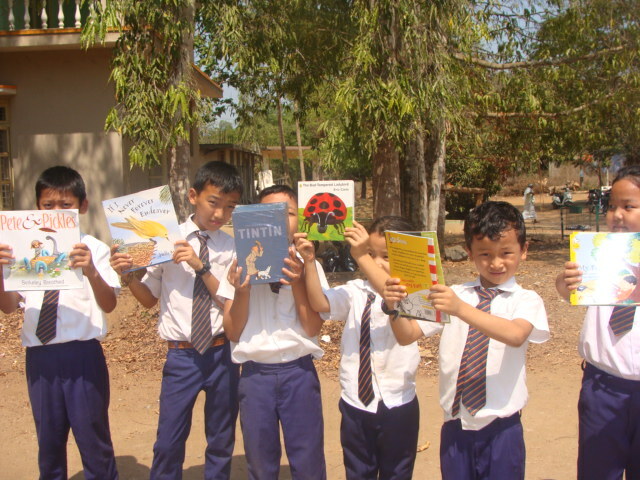 A while back here on Boing Boing, Xeni wrote about our helpwithbooks.org and Mundgod Public Library projects for Tibetan refugee children in India. We received tremendous support from Boing Boing’s community of readers, who bought hundreds of books for the library. Thuk Je Che! (Thank You in Tibetan) to all of you who have bought books from our Amazon wish list. We received them all and would like to share a few pictures with this post. It was a humbling and an overwhelming experience for us. We thought about how we can thank each one of you who donated, and we also feel that we owe you an update on the project. A brief background on the project: we are building a public library in the Mundgod Tibetan refugee settlement in Southern India. This settlement began in 1966 under the rehabilitation plan granted by the Government of India for Tibetans who fled Tibet after China’s military takeover. Mundgod was allotted 4045 acres of land by the Karnataka State Government for housing and agriculture cultivation, to sustain the livelihoods of Tibetan refugees who settled here. Mundgod is the largest Tibetan Refugee settlement in India. Initially, there were 4045 people here, but now the population has increased to over 16,000, consisting of both lay population and monks and nuns. This community has no Public Library, and they’re missing out on the importance of reading as an enjoyable activity, a form of self-empowerment, entertainment and learning. The Library, first of its kind in the exile Tibetan diaspora, aims to change that and create an oasis of knowledge and learning for the community and become an example to all the other Tibetan refugee settlements in India, in which lack of access to reading materials is common. Libraries lead to positive social change. They can become a center for all kinds of positive activity in our community. Tibet House Trust, London (UK) generously donated for the construction of the library building and the construction started in early 2016. We started to seek additional funds for the furnishing and initial stocking of the books for the library. We also began our book donation drive, primarily using social networks, and creating our wishlist at Amazon.in and also by word of mouth with platforms such as WhatsApp and WeChat. We began by reaching out to our friends and the community. We wanted to work closely with the members of the community, because we believe that this helps people feel ownership of the project, which in turn makes it sustainable. Support from within the community is now coming forward in donation pledges, book donations, and word of mouth support. We are very happy to see this develop. We are overjoyed to also share that His Holiness the Dalai Lama has recently blessed the library with a name- Shiwatso Library, named after the great Indian master Shantarakshita, who is one of the three patrons attributed with bringing Buddhism to Tibet. We are blessed to receive this name and the symbolism of the name to the project- which is to bring a positive change to the community. We are pleased to let you all know that the building is now almost ready with a few finishing tasks to complete. We are in the process of furnishing the library and working on the interiors. We post updates on our facebook page, we will be grateful if you visit our page and share and promote it among your friends. If you wish to donate to the project, please email us at mundgodpubliclibrary@gmail.com. If you are based in the US and France, you can make tax deductible donations to our project. For US residents, click here.
. For France residents: Tibet-les Enfants de l'Espoir. We still have our Amazon wish list, from where you can buy books for the library and Amazon.in will send them directly to our address. Here is the link.